House Judiciary Committee Chairman Jerry Nadler (D-NY) sent a letter to Acting Attorney General Matthew Whitaker seeking his testimony before panel members on special counsel Robert Mueller’s investigation into purported collusion between the Trump campaign and Russia in the 2016 presidential election. In the letter sent Wednesday, Nadler told Whitaker that he could not except the top Justice Department official’s proposed mid-February testimony date due to the partial government shutdown and reiterated his threat to issue a subpoena if he won’t voluntarily appear. 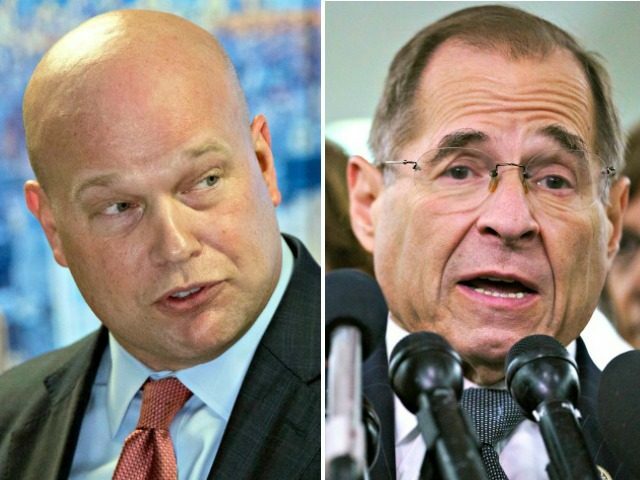 Earlier January, Nadler told USA Today, Nadler said his first act as chairman will be to ensure Whitaker briefs congressional investigators on what steps he has taken to “protect” Mueller and his ongoing investigation, and even threated to subpoena him if he is uncooperative. Nadler also told the newspaper that he plans to press Whitaker on whether he “directed Mueller not to indict somebody” or requested the special counsel forgo specific inquiries. Whitaker has spurned recommendations from a Justice Department ethics official to recuse himself from the Russia probe, according to CNN. In a written recommendation, the official is said to have told Whitaker what while his involvement in the investigation poses no legal conflicts, it could reflect poorly on the public. “If a recommendation were sought, they would advise that the Acting Attorney General should recuse himself from supervision of the Special Counsel investigation because it was their view that a reasonable person with knowledge of the relevant facts likely would question the impartiality of the Acting Attorney General,” the letter reads. President Donald Trump appointed Whitaker on November 7 as acting Attorney General following the resignation of his boss, then-Attorney General Jeff Sessions.